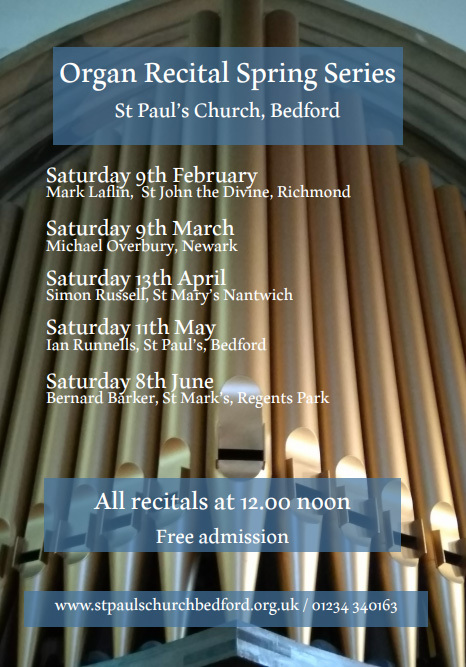 Our series of Saturday lunchtime organ recitals will be held at St Paul's throughout 2019. Please see below details of the Spring recitals. Why not come along and combine your visit with a light lunch or coffee and cake from our Saturday cafe? Admission is free with a retiring collection. The Director of Music welcomes enquiries from organists who may wish to perform a Saturday lunchtime recital. Please send a very brief biography to: musicd@stpaulschurchbedford.org.uk. Please note that recitals are booked up to a year in advance.